Question: I am training for lacrosse season which is still three months away. How much should I be running? I ran cross country to try to stay in shape and improve my conditioning but now that’s over. Answer: Lacrosse, like soccer, requires non-stop running. 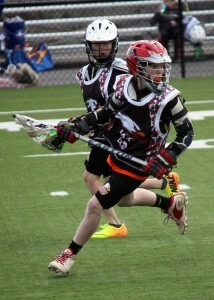 Lacrosse also requires a strong core to ward off defenders and absorb contact. You need weight training to develop the muscular body armor for the game. Get your training in for the next two months three days a week. Break your training into a two day split to cover your chest, back and shoulders on day one. On day two, you’re running but not only running for distance. You’ve already covered distance training which is good for your endurance. However, lacrosse is a game of sprint, change directions, sprint, jog, sprint some more. To prepare for that you need to run interval sprints using a 20/50/100 interval. That means 20 yards sprint then jog 20, the same for the 50 and 100. Continue to do that sequence for a mile. On day three, it’s back to the gym for legs, biceps and triceps. Abs are done each of the three weight training days using different exercises each day. On day four you’re running again except it’s shorted bursts and directional changes. This time it’s ten yards, cut right ten yards cut left, twenty yards straight breakaway. Then you get to jog back to your start point and repeat. You should do this for two to three ten minute intervals. Day five you’re back to training back, chest and shoulders but it’s a different set of exercises than you used for day one. Take off for two days and the following week you’ll train legs on day one and five with only one upper body training day. For the runs, you’ll return to a two to three mile distance run in 18 to 21 minutes. The second run day is hill or stadium sprints. If it’s hills estimate 20 yards and run 10 of those. Rest two minutes and repeat. You’ll run 50 total. If you are using a stadium then run through all the stadium steps 5 times recover 4 minutes and repeat. Get started now and you’ll be in prime shape for your season.